Luka Radovich scored a team-high 23 points for Cresskill, which came from 12 points down in the fourth quarter to beat Bloomfield Tech, 67-58, in overtime in the Group 1 semifinals on Friday night. EAST ORANGE – There was a party happening inside the gym at East Orange Campus High School on Friday night and Cresskill looked like the uncomfortable guest trying to slink out the backdoor. In the span of just 3:54 in the back half of the third quarter, Bloomfield Tech turned a five-point deficit into a double-digit lead as it ran off 17 straight points on the shell-shocked Cougars. The gym was rocking and the crowd was still buzzing about Kyle Beckford’s dunk, a tomahawk job that could have pulled down the basket and the whole apparatus supporting it. Cresskill’s George Sikoryak was closest defender too it and he got a pretty good view of the fastbreak slam that was a part of the run that looked like it was going to bring the Cougars’ sterling season to a screeching halt. Wait, did he just say overtime? He did and that is because Cresskill answered Bloomfield Tech’s run by closing regulation with a 17-5 spurt of its own to get even. And when the overtime started, Sikoryak simply took over. The senior, who will play at Ithaca College next year, was held to just three points over the first four quarters by Bloomfield Tech’s aggressive traps and relentless pressure on the ball, but Sikoryak outscored the Spartans all by himself in the extra session. When all was said and done (and a lot was said and done in a chippy, foul-filled, slobberknocker) Sikoryak scored 10 points to Bloomfield’s Tech six in the bonus four minutes and Cresskill was the team in the partying mood after a 67-58 victory that moves it into Sunday night’s Group 1 state final at Rutgers University. 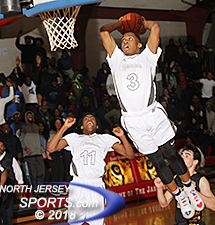 Kyle Beckford going in for the dunk that came in the midst of a 17-0 Bloomfield Tech run that ended with a 47-35 lead for the Spartans. The whistles started early with the three-man refereeing crew eager to get a handle on what was obviously going to be a physical contest. Bloomfield Tech contests every ball-handler’s every dribble, goes for just about every up-fake on the interior and hustles after every 50/50 ball. Cresskill was out to prove that it was not intimidated and matched that energy. The Cougars were the first into foul trouble when starting center Wellington Ventura picked up his second personal with still 3:09 to play in the first quarter and he got his third just 1:44 into the second right after Cresskill had put together a 10-0 run to take a 17-10 lead. The Cougars were up 29-26 at the half and Ventura, back on the floor to start the second half, opened the third quarter with two straight buckets to make it a seven-point game, but the Spartans’ pressure and willingness to hit the offensive glass was about to pay off. Kyyon Champon’s putback got momentum heading in Bloomfield Tech’s direction and it was due north from there as a 21-2 run changed the dynamic of the game. 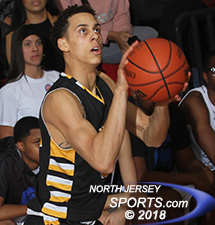 From holding its own, to hanging on for dear life, Cresskill trailed 47-35 when Beckford knocked in a three-pointer from the wing with 1:01 left in the third period. Wellington Ventura and Cresskill are heading for the Group 1 state finals for the third time in program history and for the first time since 2002. Harrison Lucibello’s three-point play and Radovich’s fastbreak basket gave Cresskill the stabilizer it needed, a 5-0 run in the final 11 second of the third quarter that got the Cougars to within 47-40 and they opened the fourth quarter by scoring the first four field goals to make the comeback stick. Lucibello’s three from the wing got Cresskill to within 49-47, Michael Ferrara’s two free throws made it a one-point game and then Radovich hit a big one, a triple from just off the top of the key that gave Cresskill a 52-50 lead with 2:37 to play. The next 2:25 passed without a point either way before Champon got Bloomfield Tech even with a take with 12 seconds left in regulation. Cresskill had three shots at the game-winner, a three-pointer and two rushed putback tries, but none of them went in and the game headed to overtime where Sikoryak seized the opportunity and Bloomfield Tech basically fell apart. Champon, who finished with a game-high 31 points, opened the bonus period with a driving layup, but Sikoryak scored the next eight points. He tied the game for the last time with a bucket from the baseline, drove to the basket to give Cresskill the lead for good, made two free throws to double the advantage and then scored on the fastbreak to make it 60-54 with 1:07 left in the OT. That last bucket came after a Lucibello steal and Ferrara assist that sent Sikoryak into the open floor and it was on that play, when he hit the breaks to let a trailing defender fly by, that Beckford, literally, jumped right over and pretty easily cleared Sikoryak’s head. While Champon led all scorers with his 31 points, Bloomfield Tech was top-heavy. Beckford finished with 11 points, Tyrese Johnson added 8 and Dashaun Galloway and Ibn Everellete evenly split the other 8 points for the Spartans, who did not get any points off their bench. 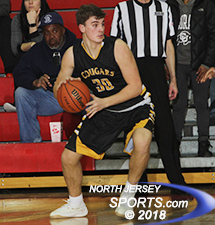 Cresskill (29-3) was balanced as Radovich led the way with 23, including three three-pointers, with Sikoryak (13 points), Lucibello (12 points) and Ventura (11 points), who picked up just one foul over the final two-and-a-half quarters plus overtime and was on the floor to finish the game, also finished in double figures. Ferrara scored 5 points and provided a much needed physical presence and Ben Green scored 4 off the bench to help bridge the gap with Ventura on the bench in foul trouble. The win puts Cresskill in the Group 1 final for the third time in program history and for the first time since 2002. The Cougars are 0-2 in their previous trips, but they certainly have the wind behind them heading into the Rutgers Athletic Center on Sunday against Woodbury.